TO THRIVE, HIGHER EDUCATION NEEDS A SECURE ENVIRONMENT. DISCOVER THE UNSEEN ISSUES FACING HIGHER EDUCATION. Learn what Canon Solutions America’s security solutions can do to help institutions innovate for success in this collection of security-focused surveys, infographics, and issue briefs. 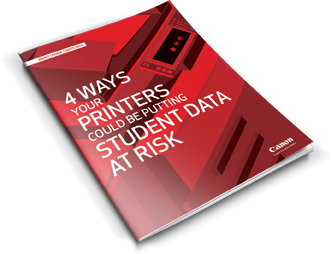 SECURING STUDENT DATA MEANS UNDERSTANDING SECURITY THREATS. The Center for Digital Education explores the threats and security solutions crucial to keeping student data safe. Learn about privacy mandates and the three layers to security that educational institutions must take to help secure student data. 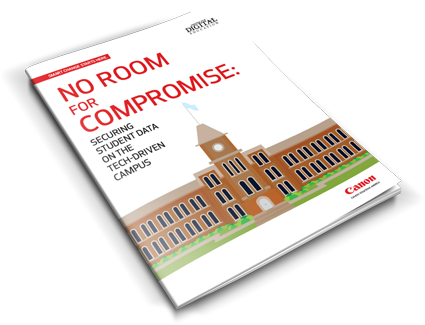 Download No Room for Compromise: Securing Student Data on the Tech-Driven Campus. Continue exploring the data security risks and solutions in higher education. *Center for Digital Education. Research Survey. e.Republic. 2017. Behind Higher Education's Next Big Leap: How Higher Ed is Securely Transitioning into the Digital Age. **Center for Digital Education. Issue Brief. e.Republic. 2016. No Room for Compromise: Securing Student Data on the Tech-driven Campus.